increasing populations for dryland regions to be self-sufficient in terms of food and fiber production. However, crop yields in dryland regions can be increased by enhancing water use efficiency. 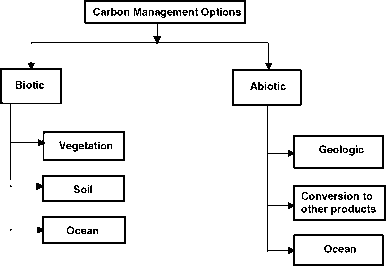 An example of benefits that can accrue from improved water management practices is shown in Figure 14.3. These data are farmer yields of wheat grown in Deaf Smith County, TX, where average annual precipitation is about 450 mm, and annual potential evapotranspiration is about 1800 mm. Therefore, drought is a common occurrence and severe water stress occurs every year. The yearly precipitation amounts show a range from less than 200 mm to more than 800 mm. A 10-year moving average (each yearly point is the average precipitation amount for the year shown plus the 9 previous years) line of annual precipitation is also shown, and although there is some variation, the average annual amount has remained relatively stable. County average wheat yields for each year are also shown along with a line showing the 10-year moving averages. 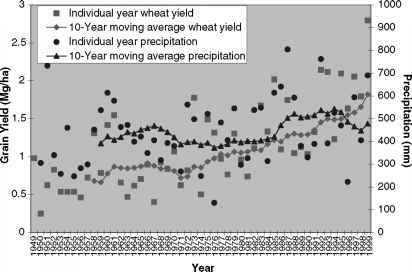 It is noteworthy that the moving yield average and moving precipitation average closely paralleled each other until the early 1970s. Since that time, the moving average grain yield increased essentially every year, and the average yield has more than doubled. No single factor is responsible, but it clearly shows that use efficiency of the precipitation has dramatically increased. Water management is the first factor that must be addressed in dryland regions because other technologies such as improved cultivars and fertilizers are usually not beneficial without improved water management. In the early 1970s, the cost of oil and other energy sources increased rapidly, and there was a concerted effort by researchers and extension personnel to promote less tillage and more herbicide usage. This change in priorities increased the amounts of crop residues remaining on the soil surface, which resulted in more soil water storage during fallow periods that was used by the subsequent crop. A small amount of additional water used during the growing season can increase yields significantly because the threshold amount of water required for grain production has already been met, as shown in Figure 14.1.